The most commonly reported ocular adverse reactions were cataract, myodesopsia, eye pain, and conjunctival hemorrhage. aIncludes cataract, cataract nuclear, cataract subcapsular, cataract cortical, and cataract diabetic in patients who were phakic at baseline. 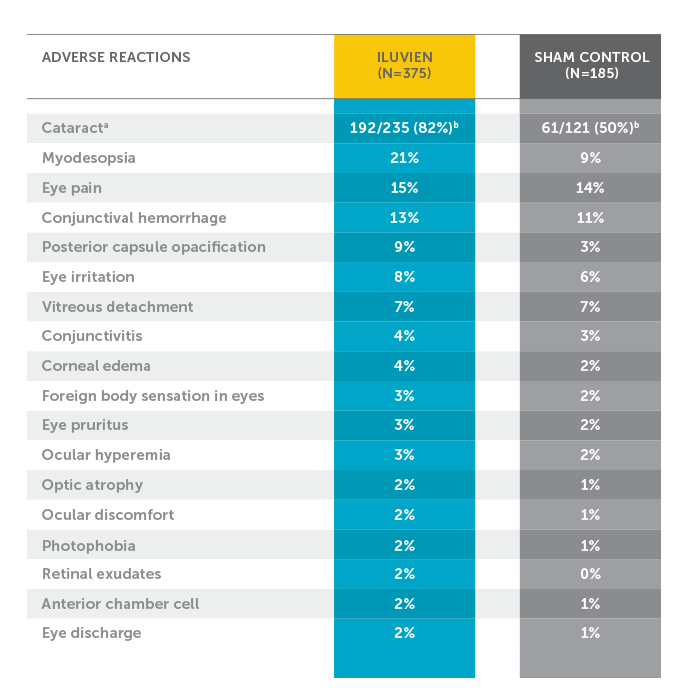 Among these patients, 80% of ILUVIEN subjects vs 27% of sham-controlled subjects underwent cataract surgery.b235 of the 375 ILUVIEN subjects were phakic at baseline; 121 of 185 sham-controlled subjects were phakic at baseline. The 18 patients requiring surgical intervention for elevated IOP would not have met the US label requirement. predictable IOP profile of ILUVIEN, when used per label. 1. ILUVIEN® [package insert]. Alpharetta, GA: Alimera Sciences, Inc. 2. Parrish RK, Campochiaro PA, Pearson PA, Green K, Traverso CE, FAME Study Group. Characterization of intraocular pressure increases and management strategies following treatment with fluocinolone acetonide intravitreal implants in the FAME trials. Ophthalmic Surg Lasers Imaging Retina. 2016;47:426-435. FAME A and B were randomized, double-masked, sham injection-controlled, parallel-group, multicenter studies conducted under a single protocol over 36 months. Inclusion criteria: Foveal thickness ≥ 250 μm despite ≥ 1 prior focal/grid macular laser photocoagulation treatment and BCVA in ETDRS letter score between 19 and 68 (20/50–20/400). Exclusion criteria: Glaucoma, ocular hypertension, IOP > 21 mm Hg, or using IOP-lowering drops. Campochiaro PA, Brown DM, Pearson A, et al. Sustained delivery fluocinolone acetonide vitreous inserts provide benefit for at least 3 years in patients with diabetic macular edema. Ophthalmology. 2012;119:2125-2132. Campochiaro PA, Brown DM, Pearson A, et al. Long-term benefit of sustained-delivery fluocinolone acetonide vitreous inserts for diabetic macular edema. Ophthalmology. 2011;118:626-635.